Explore the most trending technology "Machine Learning" and learn its flavor at the hands of experts. Machine Learning has been defined as "the future" and is being deployed in many organizations to achieve real business results. With its dramatic improvements in past few years, Machine Learning is expected to go far beyond the highest level of accuracy and understanding. DataMites™ Machine Learning training is conducted in Bangalore as a 2months/64 hours duration course in a well structured three phase module. Pre-course study helps you to develop your knowledge on the Introduction of Machine Learning. It is a self-study phase that needs to be completed before entering to phase 2 module. Phase 1 includes high-quality videos, E-books covering the syllabus of Machine Learning essentials and Practice Materials. Furthermore, it facilitates the candidates to practice scripts at a cloud lab conveniently. This is the most crucial part of the training that comes with fulltime intensive training sessions through any of the convenient channels, Traditional Classroom Training, Live Instructor-Led Online Training, and Self Paced Learning / E-learning. This phase covers the next higher level syllabus of Machine Learning Associate and expert. On completion of these well-orchestrated series of DataMites™ Machine Learning phases allow the aspirants to explore heights in their Machine Learning career. Project Mentoring: You can gain experience by working on live projects from global AI and ML Solution providers. Revision Sessions: Lots of revisions and multiple opportunities to clarify your doubts with our chief Data Scientist even after course completion. Resume Support: You can curate a customized resume at the hands of experts to make your first impression the best one. Interview Questions: Equip yourself with the latest interview questions and answers to face the interviews confidently. Mock Interviews: Our experts will help you to increase your job interview success rate and get hired quickly by practicing numerous mock interview sessions. Job Updates: All latest job updates which are validated and perspective are posted regularly by PAT Team in PAT Facebook group. The prospects for Machine Learning is seeing an increasing curve and beginning a career in ML needs an intensive training from a recognized training provider. 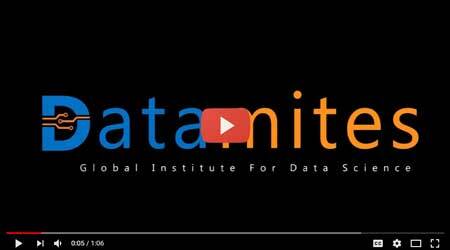 DataMites™ is India's top-ranked training provider, accredited by IABAC, delivering different training courses on Machine Learning in various cities in India. With at least two batches starting every month, the aspiring professionals can easily enroll for classroom or online ML course in Bangalore with DataMites™. Machine Learning Foundation, is designed to provide a wholistic understanding of various ML algorithms with high level theory and hands on application of ML algorithms to classis data sets. This course is delivered in the city of Bangalore as a 2-Day program traditional class training along with online content and project support. Career opportunities in Bangalore for Data Science is huge as demand for qualified Machine Learning profession is very high. Machine Learning professionals are paid with starting salary in 10 LPA. Introduce Machine Learning with wholistic approach. Access the knowledge through International Association of Business Analytics (IABAC™) framework. In recent years, Machine Learning has taken over a main stream business and evolved has a career track by itself. A quick search in job portals reveals about 20,000 Machine Learning job opportunities on daily basis in USA alone. This course lays a solid foundation for ML aspirants with high level theory and concept along with hands on coding of popuplar Machine Learning algorithms : Linear and Logistic Regression, K-means clusturing, SVM (Support Vector Machines), KNN (K -Nearest Neighbours) and Neural Networks. Who should choose this course - Machine Learning Foundation? This course provides a solid foundation in Machine Learning as the syllabus is aligned with international market requirements. The candidates attending this course gain a right perspective on ML rather than getting lost in the ocean of articles and tutorials on the internet. As a part of the course, an certification assessment is conducted and candidate achieving minimum qualifing score receive a global certification, carring immense value of the testimony of their ML knowledge.